Economic sanctions are often said to occupy a middle space between communiqués and combat. As this description makes clear, sanctions are a political tool – but a political tool that operates through economic regulation. They are simultaneously economic and political. Their dual nature seems to place sanctions in a twilight zone, neither truly in nor out of the academic discipline of international economic law ("IEL"). Sanctions tend to be marginalized in IEL scholarship, generally taking little space in the IEL literature and at the podiums of IEL conferences and courses. While economic sanctions loom large today in headline news and the practice of international trade law, they are not proportionately represented in recent IEL literature. Rather, IEL scholarship seems content to leave sanctions to other disciplines like public international law, economics, and international relations. To be sure, sporadic controversies capture attention – but typically when they implicate other IEL concerns, as when the Helms-Burton brouhaha erupted at the then-fledgling World Trade Organization ("WTO"). This article contends that sanctions are part of IEL and they warrant more rigorous consideration in IEL scholarship. 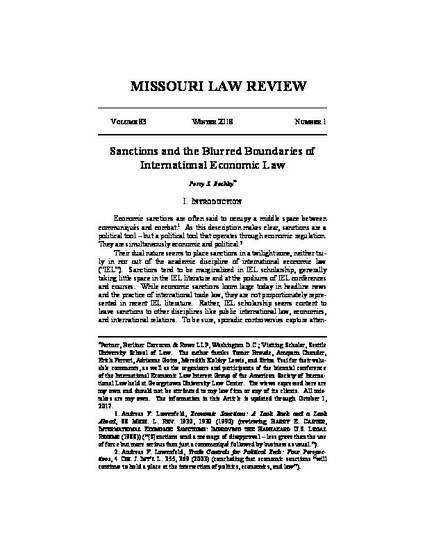 Sanctions cross both the borders between IEL and other fields, and the borders within IEL itself, thus nicely illustrating Andreas Lowenfeld’s observation in his treatise on International Economic Law that “everything is related to everything else” and “the boundaries between them are inevitably blurred.” These arguments are supported by a deep look at the economic sanctions programs administered by the Office of Foreign Assets Control ("OFAC") of the U.S. Treasury, especially the OFAC sanctions against Cuba.